NF-κB was originally identified as a family of transcription factors that bind the enhancer of the immunoglobulin κ light-chain gene. Although its function in the regulation of immunoglobulin κ light-chain gene remains unclear, NF-κB plays critical roles in development, survival, and activation of B lymphocytes. 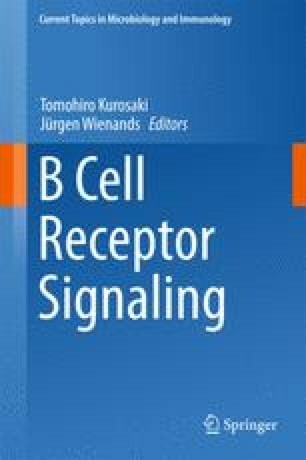 In B cells, many receptors, including B-cell antigen receptor (BCR), activate NF-κB pathway, and the molecular mechanism of receptor-mediated activation of IκB kinase (IKK) complex has been partially revealed. In addition to normal B lymphocytes, NF-κB is also involved in the growth of some types of B-cell lymphomas, and many oncogenic mutations involved in constitutive activation of the NF-κB pathway were recently identified in such cancers. In this review, we first summarize the function of NF-κB in B-cell development and activation, and then describe recent progress in understanding the molecular mechanism of receptor-mediated activation of the IKK complex, focusing on the roles of the ubiquitin system. In the last section, we describe oncogenic mutations that induce NF-κB activation in B-cell lymphoma.